Oil is often called the lifeblood of our economy-the indispensable commodity that keeps commerce humming and America on the move. But in today's world, our dependency on foreign oil and the way we use hydrocarbons is a major strategic vulnerability, a serious threat to our security, our economy and the well being of our planet. Fortunately, there are times in a nation's history when great challenges coalesce with great moments of opportunity. We are at such a moment today. We have the urgent need and the opportunity to build a safer and thriving future with more diverse, reliable, and cleaner energy. But it will take another indispensable commodity to make it happen: American leadership. Oil is a vital resource and we will always need it. But we account, as you know, for 25 percent of global demand and possess less than three percent of proven reserves. Most of the world's known reserves are in the Persian Gulf in the hands of dictators or nationalized oil companies. Its availability and price are manipulated by a cartel of countries where our values aren't typically shared and our interests aren't their first priority. National security depends on energy security, which we cannot achieve if we remain dependent on imported oil from Middle Eastern governments who support or foment-by their own inattention and inequities-the rise of terrorists or on swaggering demagogues and would-be dictators in our hemisphere. There's no doubt it's an enormous challenge. But is it too big a challenge for America to tackle-this great country that has never before confronted a problem it couldn't solve? No, it is not. No people have ever been better innovators and problem solvers than Americans. It is in our national DNA to see challenges as opportunities, to conquer problems beyond the expectation of an admiring world. As president, I'll propose a national energy strategy that will amount to a declaration of independence from the fear bred by our reliance on oil sheiks and our vulnerability to the troubled politics of the land they rule. The strategy I propose won't be another grab bag of handouts to this or that industry and a full employment act for lobbyists. It will promote the diversification and conservation of our energy sources-that will in sufficient time break the dominance of oil in our transportation sector just as we diversified away from oil use in electric power generation 30 years ago-and substantially reduce the impact of our energy consumption on the planet. It will rely on the genius and technological powers of American industry and science. Government must set achievable goals, but the markets should be free to produce the means. And those means are within our reach. Alcohol fuels made from corn, sugar, switchgrass and many other sources, fuel cells, biodiesels derived from waste products, natural gas, and other technologies are all promising and available alternatives to oil. I won't support subsidizing every alternative or tariffs that restrict the healthy competition that stimulates innovation and lower costs. But I'll encourage the development of infrastructure and market growth necessary for these products to compete, and let consumers choose the winners. I want to improve and make permanent the research and development tax credit. I want to spend less money on government bureaucracies, and where the private sector isn't moving out of regulatory fear, to form the partnerships necessary to build demonstration models of promising new technologies such as advanced nuclear power plants, coal gasification, carbon capture and storage, and renewable power so we can take maximum advantage of our most abundant resources. Answering great challenges is nothing new to America. It's what we do. We built the rockets that took us to the moon-not because it was easy, but because it was hard. We sent space probes into the distant reaches of the universe. We've harnessed nuclear energy, mapped the human genome, created the Internet and pioneered integrated circuits that possess the computing power of Apollo spacecraft on a single silicon chip you can barely see. We can solve our oil dependence. You can't sell me on hopelessness. You can't convince me the problem is insurmountable. I know my country. I know what we're capable of. We're capable of unimaginable progress, unmatched prosperity, and vision that sees around the corner of history. We've always understood our times, accepted our challenges and made from our opportunities another, better world. For The Record is an excerpt of a speech by, U.S. 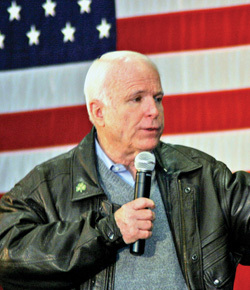 Senator John McCain at the Center for Strategic and International Studies in April 2007.